A healthy economy is one that meets the needs of the populace. 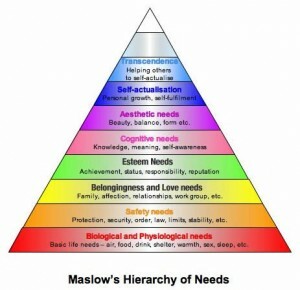 According to Abraham Maslow, the needs of people can be seen as a hierarchy, starting with safety, health, and security, moving up to belongingness and love, reconciling the need for a healthy self esteem, developing the cognitive needs for understanding and knowledge, creating aesthetic needs for the enjoyment of beauty, and encouraging them to become self actualized. Unfortunately, in the climate of competitive capitalism as the sole economic system, many of these needs go unmet when citizens are unable to appropriately compete due to lack the lack of resources that the competition demands. Even in America, highly touted as the most wealthy nation on the planet, many people are unable to provide their own safety, health, and security to an adequate measure whereby they can address their other needs. In this competitive climate, where people are directed to appreciate independence, the need for belonging also goes undernourished. In more collaborative cultures, where interdependence is more adequately celebrated and applied, although the communities may be less materially affluent, there is a larger Gross Domestic Happiness factor. If we can address these discrepancies in our economy, we can then realize a more robust and wealthy community. By integrating time-banking into our economy and sharing our wealth on a more communal basis by encouraging interdependence and collaborative, participatory economics rather than only a competitive model, we will be able to help each member of our community meet their needs, thereby enabling society as a whole to actualize our unity and develop greater overall wealth. Steve McAllister is the author of The Rucksack Letters and How to Survive an Estralarian Mind Meld. He posts regularly at The Unbroken Path and is currently the Director of Operational Development for the Common Wealth Time Bank in Sarasota, Florida. Follow him on Twitter, Facebook, and YouTube. If you are a resident of Sarasota, Florida or a neighboring county, please join us at CommonWealthTimeBank.com. If you live elsewhere, please feel free to use the information on this site to start and cultivate a time bank in your own community.